I figured I better get this outfit up before summer is a distant memory. I am definitely a sale and coupon shopper. And I love finding clothes through end of season sales. I think late August and September is the best time of the year to buy shorts and summer tops. These shorts were an end of summer purchase from last year and they have really pulled their weight this summer. 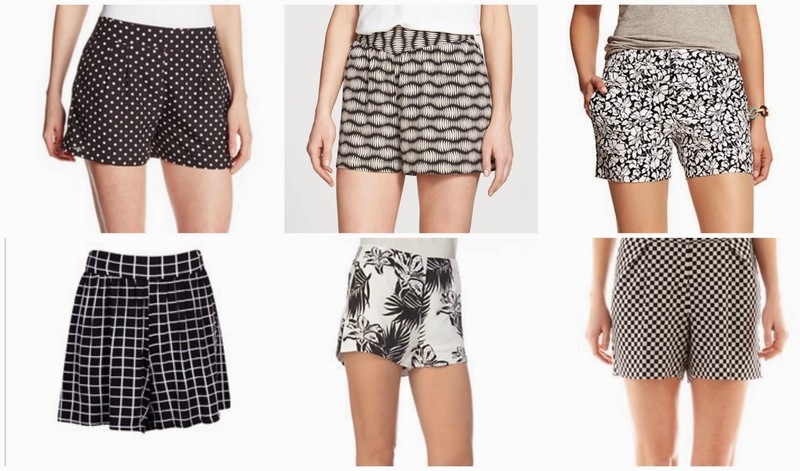 If you are thinking about diving into the printed shorts trend, I highly recommend trying a black and white pair! I've tried these with every color in my closet but navy! You can see how I've worn them here, here, here, here, and here. Check out some of the black and white shorts on sale for less than $25 now! These shorts are so cute paired with pink, Love it! Love every time you wear those Old Navy shorts. They are the perfect length and very versatile. Great contrast with the pink! loving these shorts! and today is the one day it's been cool here in Atl! I have these exact same shorts and I always feel stumped by them. I need to pin these looks of yours to use for inspiration! 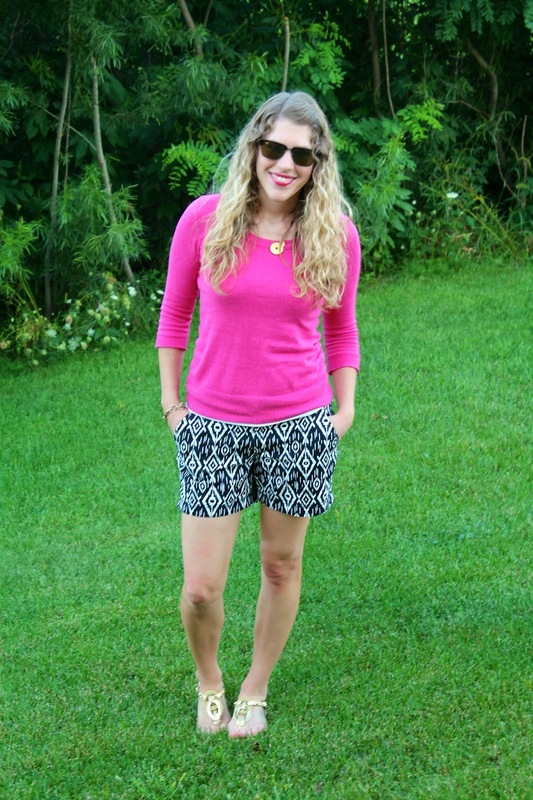 Your bright pink sweater is perfect for printed shorts! Cute picks! Love #2 & #5! I totally got into graphic shorts this year--they are so fun and a great change from just the plain jean ones :) You look adorbs! Super cute outfit. I also shopping for next year season to. It the best time to shop. Yes, they are amazing deals! Thanks for sharing. End of season is the best time to get good deals. It seems like I almost always buy boots or a jacket at the end of winter. You look so great i pink! I always shy away from wearing pink for some reason. Love the print of the shorts. I recently won a giveawy for a J.Crew gift card, and I am very tempted to stock up on some shorts in the end of summer sales! I love this pair on you every time you feature it here. Black + white looks great with pink! Yes! I love your printed shorts! With a light sweater they look amazing. Great printed shorts. I do love to buy clearance items to wear for next year too. Hope to see you Thursday for my weekly link up. Those shorts are so much fun, and I LOVE how they look with that hot pink sweater!! !